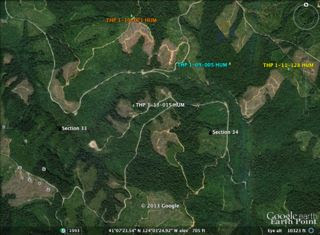 THP 1-13-020 SON (East Tobacco Creek THP) Mendocino Redwood Company, 231 acres; 52% rehab, 48% variable retention logging. Tobacco Creek (MD: T10N R13W Sec.35). Wet weather operations, moderate erosion hazard, landslide terrain, steep slopes up to 65%, steep roads, 8 road drainage work sites, impaired 303.d watershed, coho watershed, herbicides, 3 spotted owls within .7mi, long beard lichen, trees up to 34" dbh. Estimated public comment deadline: 05/09/13. 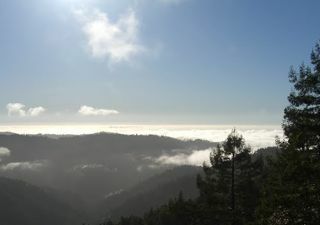 This THP is about 5 miles SE of the town of Annapolis in Sonoma County. Mendocino Redwood Company is planning a tractor logging operation on very steep slopes above the Gualala River at an elevation of 380 - 1,360 feet. 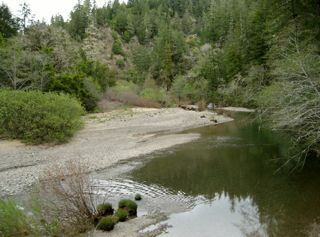 The Gualala River watershed is an important Coho salmon and steelhead fishery, and is listed as “impaired” for sediment and temperature. 119 acres of rehab logging is planned which is similar to clearcutting but in this case will be done to remove excess diseased tan oaks from a prior burn, and re-establish conifers. They are also planning to build a short segment of steep road to access a ridge line around some rock bluffs. A cluster of Douglas fir host trees were found containing Long Beard Lichen, and will be protected. There were also 4 unstable areas reported within the THP area. More information is available on the THP Tracking Center website. Redwood Empire Sawmills to log in steep terrain near Big Basin Redwoods State Park. THP 1-13-017 SMO (Gazos Middle Fork THP) Redwood Empire Sawmills, 366 acres; 99% selection, 1% no-harvest, misc roadside logging. Gazos Creek (MD: T8S R4W Sec.26, 34, 35, 36). Winter operations, extreme erosion hazard, road failure sites, landslide terrain, steep slopes up to 75%, 51 road drainage work sites, coho watershed, CA red legged frog within .5mi, 2 occupied marbled murrelet stands within 300 feet, great blue heron and common owl sightings, scattered trees over 48" dbh. Estimated public comment deadline: 05/06/13. Redwood Empire Sawmills is planning a tractor and cable logging operation in the Gazos Creek Watershed, adjacent to Big Basin Redwoods State Park in the Santa Cruz Mountains. 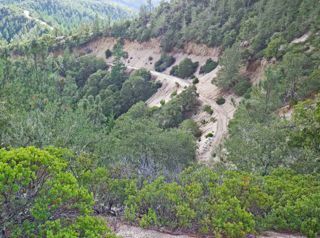 At an elevation of 680 - 1,880 feet, the terrain is very steep and includes 28 unstable areas mostly related to steep head walls, seeps, cut banks, fill failures, debris slides and bank sloughing features. There are 51 road related work sites including road re-alignment of fill failures, cut bank seeps, culvert repair/replacement and dip construction planned. Redwood Empire Sawmills plans to use tractors on steep slopes designed for cable logging, to work on steep unstable roads and on steep slopes with a high/extreme erosion hazard rating. They also plan to use skid roads and haul roads in and around class II watercourses. Two occupied marbled murrelet stands known as the Middle Fork Gazos and Bryan Grove are within 300 feet of the THP, and marbled murrelets have been seen flying over the THP area in the past. The THP includes a 27.7 acre special treatment area adjacent to the park boundary to minimize visual effects, and scattered large redwood trees over 48” dbh. More information is available on the THP Tracking Center website. 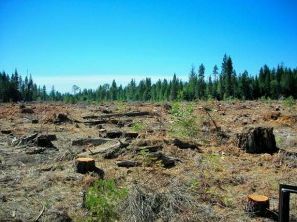 Tell SPI: We want to know what is happening to our forests and watersheds! 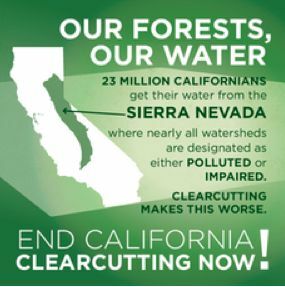 Did you know that, here in California, 75% of our water comes from our forests? But right now, big timber companies like Sierra Pacific Industries (SPI) are allowed to threaten this precious resource to line their pockets. SPI is able to hide behind paperwork and bureaucracy while threatening our precious watersheds with destructive clearcutting. From beginning to end, cleacutting is a devastating process. After the vast majority of trees are chopped down, the same area is usually aggressively doused in herbicides and pesticides -- chemicals that can potentially seep into our drinking water. At the same time, soil no longer held in place by trees flows into rivers and streams, clogging the waterways with sediment. 23 million Californians get their water from the Sierra Nevada alone, but nearly all watersheds in the region are designated as either polluted or impaired. An open and clear accounting of what is happening to California's forests will be the first step towards the true accountability and public oversight necessary to protect our forests and watersheds. Unfortunately, SPI doesn't make it easy for us to know what is happening. Just last week, after a torrent of critical public questions on its Facebook page, SPI blocked all public comments. We know they are listening but we have to keep up the drumbeat. The water that flows from California's forests is invaluable to our way of life -- communities rely on it for clean drinking water, it sustains our agriculture economy and provides crucial habitat for much of our beloved and threatened wildlife. Will you stand with us to protect our forests, water and way of life? Sign the petition and show SPI we won’t be silenced -- we demand to know what is happening to California's forests and water! THP 2-13-010 LAS (Campbell Mountain THP) Fruit Growers Supply Company, 1530 acres; 39% sanitation salvage, 25% shelterwood, 19% selection, 17% clearcut, misc roadside logging. Bridges Creek, Pine Creek Valley, Pine Creek Valley (MD: T31N R9E Sec.5, 6, 7, 8, 17, 18, 19). Winter operations, low erosion hazard, slopes up to 45%, impaired 303.d watershed, herbicides, 1 CA spotted owl within 1.3mi, red fox camera sightings, goshawk sightings within .25 mi, greater sandhill crane sightings within .25 mi, osprey and badger sightings, scattered large trees. Estimated public comment deadline: 05/02/13. 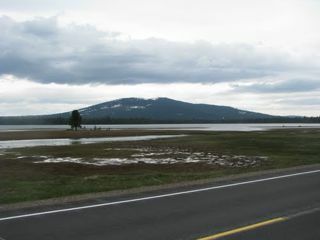 This THP is about 13 miles north of the town of Westwood, CA in the Lassen area near Highway 44. Fruit Growers Supply Company is planning a large 100% tractor logging operation at an elevation of 5,640 to 6,440 feet that contains some nice high elevation Lodgepole pine and red fir stands. The THP area is close to one of the few areas in California that contains the elusive Sierra Nevada Red Fox. There were bated camera sightings reported of red foxes in the THP area, and near county road 105. OR 7, California’s only grey wolf was also reported to have traveled through the area. Since most of the THP is sanitation - salvage and shelterwood removal, large trees will be removed destroying habitat used by the California Spotted Owl, Northern goshawk, Sierra Nevada Red Fox and Pine marten which have all been seen in the area. The THP area also contains some beautiful seasonal meadows and lakes used by Greater sandhill cranes, osprey and American badgers. More information is available on the THP Tracking Center website. THP 2-13-009 PLA (Square Root THP) Sierra Pacific Industries, 233 acres; 73% clearcut, 18% commercial thin, 5% shelterwood, 4% selection, misc roadside logging. Long Canyon, Brushy Canyon (MD: T13N R12E Sec.3, 4, 6, 8, 10). Winter operations, moderate erosion hazard, 3 unstable areas, road failure site, steep slopes up to 60%, steep roads, 3 oversized units, herbicides, 5 CA spotted owl territories within 1.3 mi, 4 goshawk territories within 2.8 mi, CA red legged frog within 1.25 mi, foothill yellow legged frog sightings, trees up to 103 years old. Estimated public comment deadline: 04/29/13. 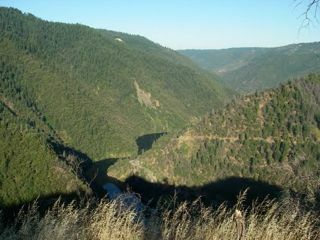 This THP is generally east of Sacramento and I-80, about 14 miles east of the community of Foresthill near the North Fork of the American River at an elevation of 3,400 to 4,500 feet. Sierra Pacific Industries is planning a tractor and cable logging operation that will mostly clearcut and thin mixed conifer stands up to 103 years old. The THP area contains some steep slopes and 3 unstable areas mostly from legacy mining impacts. SPI is planning to build a temporary road around one of the unstable areas, and use ground based equipment on steep slopes over 65% in cable unit 101. They are also requesting an exception to be able to construct and use temporary roads during the winter period, and to be able to use a skid road near a class II watercourse. There were 4 goshawk territories reported in the area ranging from .1 mi up to 2.8 mi away, and 11 CA spotted owl territories reported in the area from .25 mi to 5.5 mi away. More information is available on the THP Tracking Center website. (Sacramento, CA) – Today, the Sierra Club sent a letter to Sierra Pacific Industries asking for the disclosure of specific details on the extent to which that company has engaged in the clearcutting of California forests. In conjunction with that letter, a corresponding online campaign was launched encouraging Sierra Club activists to demand the same details from Sierra Pacific via email, Twitter and Facebook. 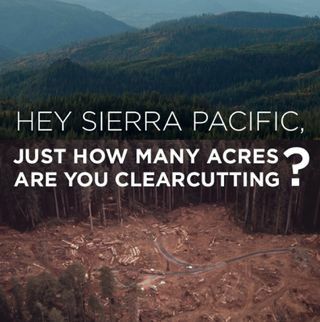 The letter from Matsumoto and Kathryn Phillips, the Executive Director of Sierra Club California, requests that Sierra Pacific Industries disclose the acreage of harvesting by clearcutting over the previous five years and the acreage expected to be clearcut in the coming year. The request also asks that clearcutting be reported by county and watershed. THP 1-13-015 HUM (BL 2610 14 THP) Green Diamond Resource Company, 65 acres; 87% clearcut, 11% selection, 2% no-harvest logging. Pitcher Creek (HUM: T9N R1E Sec.33, 34). Wet weather operations, moderate erosion hazard, slopes up to 40%, oversized units, coho watershed, herbicides, 4 spotted owls within 1.3mi, bald eagle nest within .6mi, osprey nest within .25 mi of unit a, trees up to 48" dbh. Estimated public comment deadline: 04/16/13. 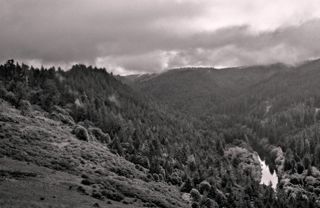 This THP is about 15 miles north of Arcata, CA on GDRC lands at an elevation of 680 - 860 feet. Green Diamond Resource Company is planning a mostly clearcut THP in an area that has seen lots of clearcut logging in the past. The THP is about 1,200 feet from the North Fork of Maple Creek, which is an important fishery for coho salmon, Chinook salmon, steelhead and coastal cutthroat trout. Tractor and cable logging is planned in second growth redwood and Douglas fir. More information is available on the THP Tracking Center website.